Wegmans was handing out free samples of Sumo Citrus while we happened to be there grocery shopping, so we tried some. Because fruit is good and fruit with funny names is even better. The Sumo Citrus is a seedless tangerine-orange hybrid originally developed in Japan and named for its resemblance to a Sumo wrestler, topknot and all. We bought two to take home and I'm already a fan. It's sweet, tanger-orangey goodness you can peel and eat without getting sticky juice residue all over your hands. More food in mouth and less on hands is a win-win in my book. 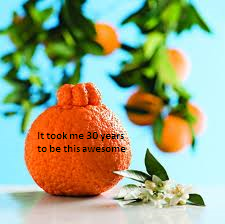 I appreciate the fact that it took over thirty years for the Japanese grower to develop his Sumo Citrus. I imagine it's rare for the fruits of one's labor to literally be fruit. And it's nice to know that some things only get better in their thirties. Release. And for comedic relief, an epic fall.